Pokémon Go | How Can You Lure New Business With Pokémon Go? The world has gone mad for Pokémon Go. Since its release in early July 2016 nearly 30 million people have downloaded the game. Indeed, you may have noticed its impact on the general public yourself. People rather awkwardly stopping in the middle of the street to mess about with their phones or strange gesticulations of others, phone in hand, as they sit in the car or stroll down a public walkway. Pokémon Go is an augmented reality game that can be downloaded and played on a number of digital devices. Once the player does so, they must create an avatar that will represent themselves in the game. Hair, skin, eye colour, style, and outfit are all left up to each individual player. Pokémon Go uses Global Positioning System, or GPS to fix on the location in which the player happens to be. The general features of that locale are then re-created in the game. As the person goes along, the scene changes to correspond to outward realities and new challenges are set which constitutes the gameplay itself. If, for example, you drive from your office to the water way a water-born creature for you to capture may appear near the dock. Players have the ability to set the graphics for a generic background or a setting that replicates the exact place in which you immediately stand. The advent of Pokémon Go is a revolutionary step forward in gaming. Local landmarks and business have been transformed into Pokémon Gyms, where players can stock up on free accessories and items such as Poké Balls. 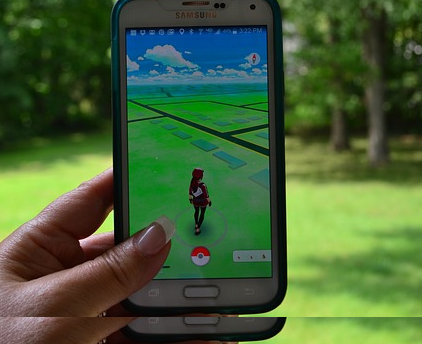 Players can also meet at gyms and battle residing players making Pokémon Go one of the few games that allow the choice of individual or group play. The latter function is where the good news lies for local businesses. You should, if you have not already, download Pokémon Go. Your shop very well could be a Pokémon Gym or a PokéStop. If you are, then you will see a large increase in your foot traffic. And this, of course, you can transform into increased sales. The last thing you should do is take a crabby approach to Pokémon players. Putting up signs saying that Pokémon stops and gatherings are for paying customers only is a bad idea. The people who will most likely be playing the game may be more than willing to buy from your shop, in their own time, but they will be completely turned off if they feel unwelcome. Younger people, who constitute the majority of Pokémon players, have a laid back and freewheeling attitude toward such matters. They will be more likely to not only make a purchase the first time but to continue coming back to your shop if they feel you are as carried away by the spirit of the game as they are. You should make an effort to promote your business as one that actively welcomes players. While the rage for Pokémon Go still reverberates throughout the country you should prove that you are hip and in tune with the direction of things. This will create a buzz around your store. Players will not only repeatedly come to it, but they will also tell their friends about it. Get creative about making your business and your brand part of Pokémon fever. There may be stops and Pokémon creatures scattered throughout the grounds or vicinity of your shop. You should show that you are in the groove of things by taking photos of yourself and your team in the different locations where Pokémon have been known to be. Then post these pictures on your blog or social media. This can only encourage people to come your way; and, while they are in the neighbourhood, stop in at your store and make a purchase. If you own a coffee shop or restaurant, you can really boost your Pokémon bona fides by creating a drink or a dish specially named after a specific Pokémon. And you can combine the promotion by offering customers who show the game on their phone or other device a discount. The object of going along with Pokémon mania is to lure in bodies. The game offers entrepreneurs and small business owners one of those rare opportunities of wide exposure and promotion that they do not have to pay large amounts of money for. It has become quite clear that Pokémon is now an unprecedented cultural phenomenon. The numbers who have downloaded the game has surpassed all expectations and people have become obsessed with play. This is one of those rare times when you can get in the black before the holiday buying season. As a matter of fact, this summer has become a kind of Christmas for many gamers, in that they are able to enjoy and recreate themselves for hours and days at a time. You must sit down and think through the many ways you may be able to take advantage of the event. Fortunately, you do not have to rely solely on your own marketing and promotional resources. You can purchase “Lure Modules” from the app that can be applied to a PokéStop in your vicinity. Lure Modules help increase foot traffic by alerting surrounding players that a Lure Module is active and will start spawning Pokémon at that location for 30 minutes. This is a great option for times during the day in which it is especially slow. You can also use the Lure Module strategically. You can host events and activities in different places through the city and employ it when you are ready. This can be the kind of investment that continues to pay off long after the event itself is over. You can use the Pokémon game to introduce your business and your brand to a large number of customers who may not have otherwise come across your shop. Engaging in this kind of planning and maneuvering is a great way to use the Pokémon Go fad to your financial advantage.